During a recent tour of Samut Sakhorn, an industrial and fishing region to the west of Bangkok, General Sonthi expressed alarm at the number of children being born to migrant workers there [like those in photo above], and said that he would introduce measures to address the “problem” before it becomes unsolvable. He hit on the idea of deporting ladies prior to giving birth and added that arrangements should be made to deal with them thoroughly, lest human rights groups get involved. This proposal undoubtedly impressed the province’s governor, as he had already ordered that factory owners monitor their migrant workers for criminal behavior and prevent the spread of “aliens’ culture.” Lawyers in Thailand have said that his directive is illegal. Apparently they haven’t yet accepted that under the current regime anything goes. Sonthi has good reason to be worried about national security. As head of the Internal Security Operations Command, a post that he has retained although he is no longer army chief, it’s his job to sniff out threats to the nation, and invent them when they don’t exist. Although the former prime minister, Pol. Lt. Col. Thaksin Shinawatra, also came up with all sorts of imaginary dangers, they were but a few among many ploys which he used to stay in government. Now, national security is the only game in town. And it’s a game that’s worth billions. That’s why the National Assembly is considering the latest draft of an internal security law which will heap enormous powers on the command that Sonthi currently oversees. The former government proposed such a law in 2004 but quickly lost the stomach for it after realizing that it would face stiff resistance. The current one has little to fear. The army appointed this Assembly, and it consists mostly of serving or former military and police officers and bureaucrats. Unsurprisingly, the bill sailed through its first reading, with only a handful of votes against. The Democrat Party has since said that if it succeeds in forming a government after the December polls then it will seek to amend the law. Thus the military has successfully shifted the starting point for any debate from whether or not there should be such a law at all as to what shape it should take. Going by this draft, it has no shape at all. Like other laws passed under this regime and its predecessor — including the emergency decree over the southern provinces and the computer crime law — its defining feature is its patent ambiguity. Like them, it is not merely open to interpretation, as is all law to one degree or another, but has been written to defy coherence. Like them, it is a law by virtue of being named one, rather than by virtue of its contents. The draft begins with the general comment that there exist “security problems caused by various people or groups of people.” This is hardly a remarkable pretext for the gamut of powers that it proposes handing to the security forces to intervene into “any situation that is or may be a threat … for the sake of the peace and order,” at any time, and however they see fit. To do this they will not require approval from Parliament: a simple directive from the Cabinet will suffice. And whatever happens next will not fall under the purview of the courts. All in all, the draft envisages Thailand as being in a permanent state of emergency while not actually having an emergency. The opportunities that it will offer the military for involvement in the affairs of state, without judicial oversight, will be greater than anything before. Earlier security laws were at least written to combat supposed specific threats. By contrast, this bill locates perils everywhere and anywhere, from garment factories to community radio stations — and in everybody and anybody, from Bangkok taxi drivers to Burmese fishermen. The law’s passage will achieve the real goal of last year’s takeover: not the removal of a civilian autocrat from power but the reassembling of the elite military-bureaucratic state that had come under threat in the last two decades. It thus guarantees not security but its exact opposite. And for this reason, it deserves to be opposed in every way possible, and in its entirety. Against this backdrop, General Sonthi’s attack on expecting mothers from across Thailand’s borders is much less about defending the interests of the realm than about defending those of the armed forces. Good old-fashioned military masculinity, not pregnancy, is the real problem. For this reason too, both he and his harebrained ideas deserve to be opposed in every way possible, and in their entirety. 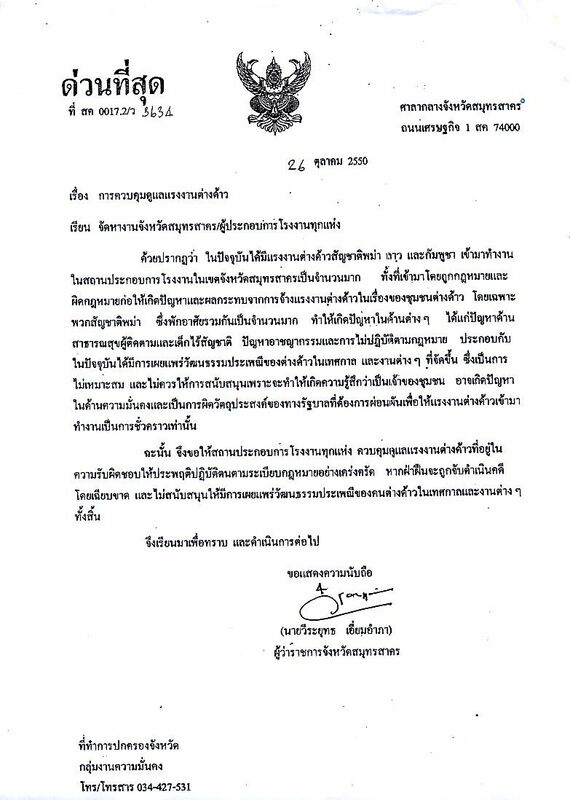 This entry was posted in army, dictatorship, human rights, military, rule of law, Thailand, UPI and tagged Computer Crime Law, Democrat Party, Emergency Decree, Internal Security Act, ISA, National Assembly, Samut Sakhon, Samut Sakhorn, Sonthi, Sonthi Boonyaratglin, Thaksin, Thaksin Shinawatra. Bookmark the permalink.